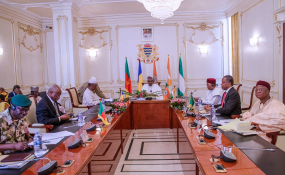 Abuja — In a bid to contain terrorists' attacks within the Lake Chad Basin, President Muhammadu Buhari yesterday chaired a meeting of member states of the Lake Chad Basin Commission (LCBC). This is coming as the Nigerian Army yesterday responded to President Buhari's directive to produce a containment plan to end the Boko Haram insurgency. Buhari met with heads of government of member states of the commission in his capacity as the chairman. The Nigerian Army said routing Boko Haram from Nigeria's borders with Chad, Cameroon and Niger Republic was top priority in the coming weeks. Following terrorist attacks on military bases and other locations in Borno State that led to the killing of many soldiers, President Buhari in demanding for a containment plan, also ordered the military to wipe out Boko Haram once and for all. In line with this directive, the army is stepping up collaboration with neighbouring countries in order to contain Boko Haram. Speaking at the ongoing Chief of Army staff Conference in Maiduguri, Borno State capital, the Chief of Army Staff, Lt. General Yusuf Buratai, said part of the strategy included building alliances with foreign arms manufacturers including Defence Industries Corporation of Nigeria (DICON). "The military's major concern now is routing the terrorists from their locations on the thin lines of Nigeria's borders with neighboring countries, and their re-grouping and re-arming across the border with support from international partners like Islamic State West Africa (ISWAP)"
"In 2018, the Nigerian Army witnessed a lot of reorganisation and redeployment in a bid to improve our overall operational responsiveness and professionalism. Just two weeks ago, I approved the redeployment of some field and operational commanders in order to inject new ideas in the command and control structure in various NA operations across the country. "We are also reorganising to align with some of our current realities. It is my belief that the Nigerian Army must start to plan and strategise on how to end the operations in the North East. To this end, I have directed for a change from a wholly defensive posture to one where we defend in numbers and conduct offensive operations in smaller packets but simultaneously in different fronts", he said, adding that no army could have sufficient equipment for its operations. "I must also add that no army can ever have enough equipment to conduct its operations. Hence, it is incumbent on all commanders and senior leaders of the Nigerian Army to recognise that we are involved in asymmetric warfare which calls for dynamism and flexibility if we are to succeed with minimal casualties. Therefore, commanders are to ensure that they show leadership at all times and continuously adapt with changing situations in order to surmount adversity in the conduct of operations. "In the course of 2018, the Nigerian Army has consolidated on its drive in the area of research and development in order to improve on our home-grown capacity to innovate, produce and maintain some of our core requirements. In this regard, we have encouraged and supported all Nigerian Army officers and soldiers who have innovative ideas and competencies. "We have also resumed full collaboration with the Defence Industries Coorporation (DICON) for needed parts and small arms and ammunition. Similarly, the Nigerian Army is partnering with several companies in Nigeria including Innoson Motors, Proforce Limited and Nigeria Machine Tools, among others, towards the production of light and heavy armoured vehicles, critical equipment as well as protective clothing for Nigerian troops. "These collaborations have led to the development of the TYB Rover, Infantry Patrol Vehicle (IPV) and the Bionbion Helicopter, among several other equipment. "We are also engaging some foreign technical companies and Original Equipment Manufacturers (OEM) to help us repair and refurbish some of our heavier and more delicate platforms. These in-house efforts are being done to complement the support that we have received from the Federal Government in the area of equipment procurement. "So far, the Nigerian Army has taken delivery of several quantities of platforms, ammunition and other needed equipment. I want to seize this opportunity to thank the president for approving the purchase of these equipment". "President @MBuhari in his capacity as Chairman of the Heads of State and Government of the Lake Chad Basin Commission (LCBC), chaired a meeting of the Heads of State and Government of the LCBC, on Security in the region. He will be back to Abuja later today (yesterday)," he tweeted.